First Aid Kits for the Motorcyclist | Hupy and Abraham, S.C.
Winter is a good time to check on your first aid kit, making sure everything is in good shape and also adding whatever items are needed to complete your pack. Motorcyclists should not rely on the common first aid kits sold in stores. We have special needs, and Band-Aids and tiny scissors don’t fit the bill. The decision on what to include depends on how much room you have to pack a kit, and what you want to spend on items. The basic essentials for every kit are quality nitrile gloves in your size, a trauma shear (just like the one EMTs and Paramedics use), and a rescue breathing barrier of some sort. Burns - sunburn and heat burns from exhaust pipes and other hot motorcycle parts. Eye injuries - things flying or blowing into the eyes and Insect bites or stings. Cuts, abrasions and scrapes - usually from hitting the road (literally). Trauma to the head, neck, spine, chest and abdomen (Box of Life). Nitrile gloves – No less than 2 pair – more is better! Anti-microbial Hand Cleaner – Waterless is preferred with at least 60% alcohol. Sting Relief & Burn Gel. Steri-strips or Butterfly bandages, Adhesive Sutures- used to pull a small laceration together. Minimum 4 large (4x4) Sterile Gauze Pads - For bleeding. Hint: paper towels in a zip-lock baggie can be used for clean up – save the sterile dressings for when you need them! Emergency Blanket - For retaining body heat that can be used as a reflector for rain and ground cover. Normal sterile saline with a squirt tip for irrigating - this doubles as an eye wash or wound cleansing. Instant Cold Pack(s) - They are single use so if you have space, grab a couple for your kit. The larger size works better. Burn cream or gel (some have lidocaine for pain)- Aloe Vera aids in healing, pain relief, has anti-inflammation properties. Glow Stick(s) - High intensity emergency glow stick for directing traffic or signaling for help. Consider Green, Yellow & Red so they can be used for triage! Heavy Duty Zip-lock Bags – Uses: disposal of used and contaminated gauze, gloves and dressings. Other medication - Pack the travel size or sample packets: Anti-diarrhea tablets, Anti-acid, Antihistamine (like Benadryl or Claritin), pain relievers, Electrolytes. Triangular Bandage - For slings, padding, strapping limbs to splints when fractures are suspected. Trauma shears - 7-inch Paramedic Shear – smaller one’s just don’t cut it! You will need to be able to cut through leather. You will not want to move a person to remove clothing - if there is heavy bleeding you will need to cut through the leathers & other clothing. Use caution as you are using the shears since they can cut through unintended items. 1 or 2 rolls of 2” or 3” roll gauze. Tweezers: Easy-to-grip handles for splinter removal and other first aid procedures. Look for soft-sided waterproof zipper cases. Consider packing items in separate strong zip-lock bags. Become familiar with what is in your kit and inspect the contents routinely. Make sure your kit is not buried in a saddle bag. It’s recommended that your first aid pack is kept on the right side (saddlebag) of your bike. Consider adding a reflective red cross on the bag and also the tour pack, saddlebag, or wherever you store the kit. Because you may not have time to read a manual while trying to give first aid to an injured person or yourself, we recommend that you take an Accident Scene Management (ASM) course to learn what first aid challenges you may encounter and how to treat them. ASM teaches the basics of motorcycle trauma using the P.A.C.T. formula and ABCSS of Trauma to prioritize treatment. While this one-day course is geared toward the lay rescuer, it is great for the EMS worker as well. Helmet removal, moving the injured and jaw thrust rescue breathing are all part of this class that prepares you to respond to a trauma scene and apply basic first aid. 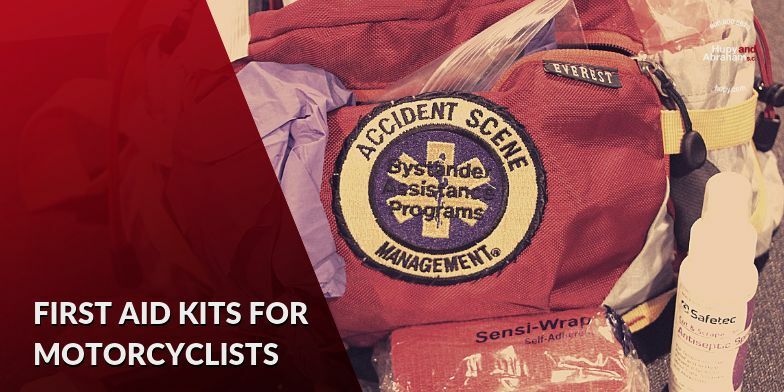 For more information about classes and a variety of Pre-packed Motorcycle First Aid Kits go to: www.accidentscene.org . You can also buy supplies to supplement your already existing kit.